What comes to mind when you think ”off road”? Maybe it’s the Dakar Rally, where the sand and heat put the crews and cars to the ultimate test. Or perhaps it’s the off-road vehicles from the Mad Max trilogy. Whatever it is, it’s probably not a Ferrari 488 or a Bugatti Chiron. Check out these designs brought to you by Budget Direct and you might just change your mind! Ferrari is expected to launch an SUV in the coming years as it expands its product range to appeal to a larger demographic. 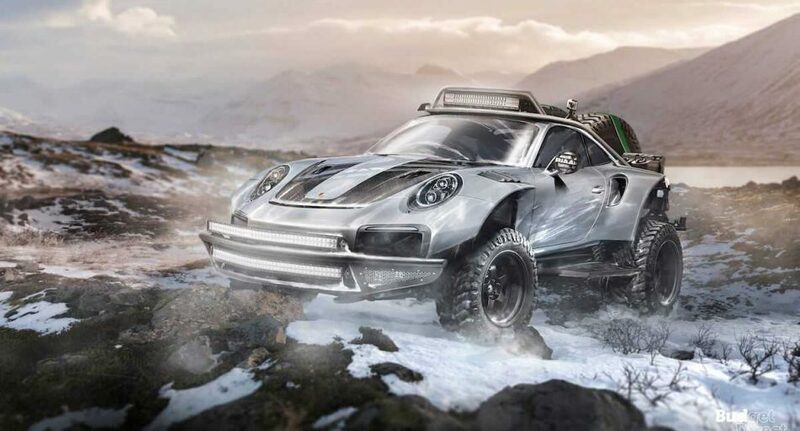 We don’t yet know what the design might entail, but we have a pretty good idea what a Ferrari off-roader might look like. Finished with the brand’s iconic red colour, this re-imagined Ferrari 488 would definitely let the Italian brand target a whole new group of car aficionados. This off-road design actually has a real-life role model. Back in 1978, a special Porsche 911 was created to conquer the East African Safari Rally. Features included raised suspension, extra headlights, off road tires and a roll-cage, among other necessary equipment. The car finished second in the rally and resides at the Porsche museum. With this in mind, we turned the new Porsche 911 GT2 RS – the most powerful 911 ever built – into an off-road monster. The Bugatti Chiron was one of the most anticipated new cars in recent years. It has an 8-litre W16 quad-turbocharged engine and go zero to 60 mph in just 2.4 seconds, according to the manufacturer. Nobody doubts the pure speed of the car, but we thought we could improve its off-road capabilities. We ripped the $2.7 million car apart and put it back together, creating this magnificent off-road Chiron. The last monster muscle car from Dodge is the Challenger SRT Demon. The car rolled out of production with a wide-body kit, a drag-strip-tuned adaptive suspension and, most importantly, a supercharged 6.2-liter V8 engine that produces 808 hp. Its drag racing capabilities are certainly up to par, but we’d like to see this muscle car tackle a completely new terrain. Behold, the muscle car off-roader. Last year, Tesla revealed the prototype of its new Roadster, a four-seater sports car expected to arrive to the market in 2020. Tesla promised that the all-wheel drive car will accelerate from 0 to 60 mph in 1.9 seconds and have an electric range of 1000 km (620 mi). Given this longer range, surely the new Tesla should be able to tackle an off-road excursion. What would Elon Musk think of this sleek design? The Jaguar F-Type is a real eye-catcher, with its long hood and elegant lines. The two-door, two-seater sports car is built on a shortened platform of the XK convertible. There are plenty of options, from coupe or convertible to various powertrains. But we noticed one option that was missing: an off road F-Type. This design takes care of that! Nissan presented the GT-R – fittingly known as Godzilla – in 2007. This Japanese sports car is powered by a 3.8-liter twin-turbo V6 engine combined to six-speed dual-clutch automatic gearbox. The 2017 model is the seventh generation of the car, and produces 565 horsepower at 6800 rpm. Nissan GT-R is no stranger to racing, and it’s competed in the Super GT series. But we’d like to see Godzilla tackle rally raids and cross dunes – something this design is perfect for. The popularity of SUVs continues to climb, and success in a rally raid would be a great advertisement for any manufacturer. We can’t wait to see some of these brands taking on the challenge and sending an off-road version of their cars to the next Dakar Rally.